Murray gained a Bachelor and Masters degree in English and Philosophy from the University of Dundee. Following this, Murray completed the Higher Diploma in Systems Analysis and Masters in Commerce from NUI Galway. His Ph.D. research studied the Public Value of citizen-centred eGovernment. Further research projects in this area have developed with academics from the Kogod School of Business, American University, Washington DC and the Kennedy School of Government, Harvard University studying the public policy implications of information systems. Murray's research has been published in leading international journals and conferences, including the AIS Senior Scholars' Basket of Journals. Murray is Head of Discipline for Business Information Systems and also the director for the MSc in Business Information Systems/Cloud Computing Research. Murray further contributes to the internationalisation strategy of the School, developing linkages with partner institutions. Murray maintains active professional and research links with leading indigenous and multi-national companies including SAP, BearingPoint, Accenture and Storm Technologies. Murray secured a strategic alliance with SAP on behalf of NUI Galway, the first of its kind in Ireland. He was awarded the HP Technology for Teaching Higher Education Grant in support of innovative teaching initiatives in the area of international student virtual teams. Murray won the Guinness IMI Sir Charles Harvey Award for outstanding achievement in business management postgraduate research. O'Neill, S., Scott, M. and Conboy, K. (2011) A Delphi Study on Collaborative Learning in Distance Education: the Faculty Perspective, British Journal of Educational Technology, (42:6) pp939-949. Scott, M., and Robbins, G. (2010) "Understanding eGovernment implementation from an NPM Strategic Reform Perspective," Communications for the Associations of Information Systems (27:1), pp 493-516. Scott, M., DeLone, W. and Golden, W. (2009) Understanding Net Benefits: A Citizen-based Perspective on eGovernment Success, 30th International Conference on Information Systems (ICIS), Phoenix, USA, December 15-18, 2009. (2011) IT quality and egovernment net benefits: A citizen perspective. 19th European Conference on Information Systems - ICT and Sustainable Service Development, ECIS 2011. (2010) Public sector IT outsourcing: a framework for evaluating risk. Paper presented at the IFIP e-Government Conference 2010. (2009) Towards a Toolset for Intranet Evaluation. 22nd Bled E-Commerce Conference on eEnablement Bled, Slovenia. (2009) Towards a Toolset for Intranet Evaluation. 22nd Bled E-Commerce Conference on eEnablement Bled, Slovenia, June 14-17. (2009) Understanding net benefits: a citizen-based perspective on e-government success. Paper presented at the International Conference on Information Systems 2009. (2008) Unravelling eGovernment: Understanding Implementation from an NPM Reform Context Perspective. European Conference on Information Systems (ECIS) Galway, Ireland. (2006) Television: A Study into the Diffusion of a New Technology in Britain and Ireland. Information Resources Management Association International Conference. (2006) Interactive Television: A Study into the Diffusion of a New Technology in Britain and Ireland. Information Resources Management Association International Conference. (2006) The influence of quality on the success of e-commerce systems. In Proceedings of the Fourteenth European Conference on Information Systems (Ljungberg J, Andersson M eds. ), 1711-1722, Goteborg. (2006) Developing Best Practice in Intranet Evaluation: A Comparison of Evaluation Models for Usability and Acceptance. Information Resources Management Association International Conference Washington, D.C., USA. (2005) E-Education - Keys To Success For Organisations. 18th Bled eCommerce Conference Bled, Slovenia. (2005) Intranet Redesign: Management And Employee Perspectives on Usability. 18th Bled eCommerce Conference. (2004) Redesigning the Intranet: Managerial and Employee Perspectives. The 7th Irish Academy Of Management Annual Conference. (2004) Business Intranet Redesign: Can High Usability Mediate Competitive Advantage?. University of Surrey, Guildford , UK. (2004) A Comparison of the Effectiveness of E-Learning Versus Instruction-Led Training for Modular Training Requirements. The 7th Irish Academy Of Management Annual Conference. (2004) A Click and Bricks Strategy for E-Government. 17th Bled eCommerce Conference. (2004) Usability and Acceptance in Small-Screen Information Systems. CollECTeR (Europe). (2004) Usability and Acceptance in Small-Screen Information Systems. University of Surrey, Guildford , UK. (2004) Implementation Strategies for E-Government: A Stakeholder Analysis Approach. 12th European Conference on Information Systems. (2003) Satellite Ireland: An Investigation of the outcomes for a Government sponsored broadband trial. Proceedings of the 16th Bled eCommerce Conference. (2003) The Role of Process Evolution in Achieving Citizen Centred e-Government. The 8th Americas Conference on Information Systems. (2002) Connecting the Citizen: The Case of the Irish Governments' Online Service Provision. In 2nd European Conference on Electronic Government. (2002) E-tailing in Ireland: a review of Ireland's top 25 retailers. In O'Toole, T. et al. (eds), Proceedings of 5th Irish Academy of Management Conference, Waterford, Ireland, September 5-6, pp. 50-51 (Abstract). (2002) the knowledge worker: A descriptive study of training practices in Irish software companies. 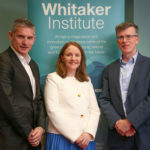 5th Irish Academy of Management Conference O'Toole, T., Harrington, D. and McCarthy, A. Waterford Institute of Technology. (2002) Training the knowledge worker: A descriptive study of training practices in Irish software companies. 5th Irish Academy of Management Conference. (2002) E-tailing in Ireland: A review of Ireland's Top 25 Retailers. 5th Irish Academy of Management Conference. (2002) Training the knowledge worker: A descriptive study of training practices in Irish software companies. 5th Irish Academy of Management Conference O'Toole, T., Harrington, D. and McCarthy, A. Waterford Institute of Technology, Waterford. (2004) The Implementation Of Citizen-Centred E-government: a Stakeholder Viewpoint. Centre for Innovation and Structural Change, NUI, Galway, Ireland; Working Papers.